This is actually the very first light novel I ever came in contact with and I sooo want to see this one getting translated too! The fairy folklore in this story is also totally interesting. Description: In the Kingdom of Highland, a country where fairies are slaves of the humans, Ann Halford, a Candy Craftswoman, decides to purchase one in order to arrive the once-yearly Candy Fair to achieve the title of Silver Sugar Master. (After her mother passes away, Ann decides to leave town in order to become a Silver Sugar Master like her mother-a highly regarded occupation in the country of Highland in which very few masters of the craft exist. Ann leaves for the town of Lewiston, where the royal family holds a sugar sculpture festival. To become a silver sugar master, she has to win the top spot and receive a royal medal. I've read the first fan-translated volume of this and really enjoyed it. 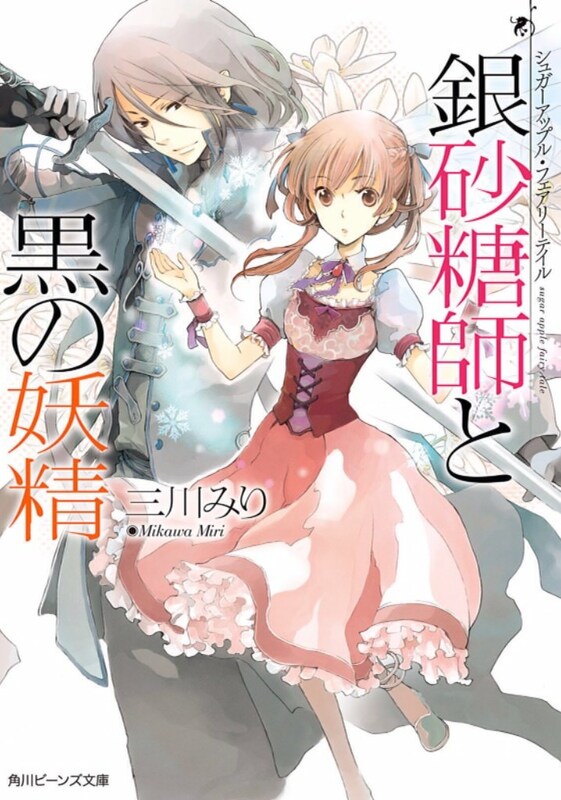 I'm all for getting more shoujo light novels licensed so you've got my vote and this one is unique as the story is not set in an otome game for once. After her mother passes away, Ann decides to leave town in order to become a Silver Sugar Master like her mother-a highly regarded occupation in the country of Highland in which very few masters of the craft exist. Ann leaves for the town of Lewiston, where the royal family holds a sugar sculpture festival. To become a silver sugar master, she has to win the top spot and receive a royal medal. Fairies in this world are treated as slaves by humans. Humans take one of their wings in order to control them. Ann reluctantly buys a fairy named Shall to be a bodyguard on her way to Lewiston. The first volume tells the story of their journey to the festival and Ann's attempts to become friends with Shall, which is impossible as long as she holds his wing. Ann is torn between setting the fairy free but needing a bodyguard on the dangerous roads to the festival to become a Silver Sugar Master like her mother. The volume ends with the results of the sugar sculpture festival. This sounds like a fun LN. I think it would be kinda hard for JNC to license a 17 volume Kadokawa shoujo novel series that never had an anime, though. This is probably one I would be fine with Sam licensing the first like 3 or so volumes to see how the market would respond. @hyperion Thanks for the better view in, I copied it in my post just in case. @legitpancake It would be nice if more 'girls' novels would be licensed. So far I had the thought, that only novels, that are better suited for guys would get licensed. @silvercat422 Could you also add the first volume's cover image to your post? Though I could see how that can helpful as you may not remember the name of a series but you will remember it from the cover. Oh hey, I was just thinking how, with all the LNs about male protagonists taking female slaves (with varying degrees of romance and emancipation), there should be some about female protagonists taking on male slaves. I guess here is one. Fairies being involved is a plus, overall story seems nice, and art looks good too... so yeah, upvoted. @stardf29 male here and wouldn’t mind series like that happening. Would be interesting to read as a male and would make a nice change to what we currently have already.